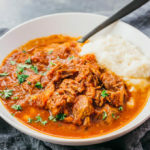 A simple dump-and-go Instant Pot recipe for beef ragu with shredded meat and a flavorful tomato sauce. Great for diets like low carb, keto, paleo, whole 30, and gluten free. Add all ingredients to the pressure cooker pot. No need to stir. Secure and seal the lid. Cook at high pressure for 35 minutes. When finished, let it sit for 10 minutes to naturally release the pressure before using the steam release handle to vent remaining pressure. Uncover. Transfer only the meat to a plate and finely shred using 2 forks. Return the shredded meat to the pot, stirring it in to soak up the sauce. Serve while hot with your choice of side, such as mashed cauliflower, and optionally garnish with chopped parsley. This recipe yields 6.5 g net carbs per serving (1.5 cups of stew or 1/5th of the recipe).